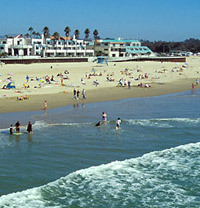 The one bedroom condos at Worldmark Pismo Beach Resort California provide a spacious 600 square feet of living area. The 1 bedroom has a queen sized bed and there is a queen Murphy bed in the living room. Worldmark and Seaventure share this resort. The units also have a full kitchen, 1 bathroom, shared patio or deck area with BBQ, and gas fireplace. We have arranged for free wireless internet access, in-room, using our owner’s account (a $20 value).